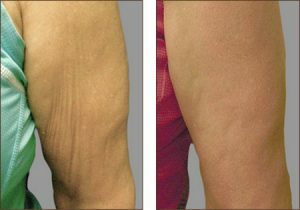 Male or female, chubby or saggy, it’s time to get your body summer ready with Exilis. Exilis is Health Canada approved and proven to reduce fat on body or tighten skin on body and Results has the only Exilis in all of Saskatchewan. Cherise has been specializing in Exilis for 5 years. She has tightened saggy knees, tightened stretched out stomachs, slimmed down chubby tummys, smoothed out cellulite. Cherise has flattened men’s chests and slimmed down their spare tires. After researching different technologies and companies and trying different treatments out, Cherise and her husband were pleasantly surprised and totally impressed with Exilis. Cherise got the first Exilis outside of Toronto, in all of Canada. This makes her the 2nd oldest Exilis Technician in all of Canada.